Of all the adrenaline activities that bestow upon the participant a brand new perspective – a unique way of seeing the world – surely Seabreacher goes the furthest. 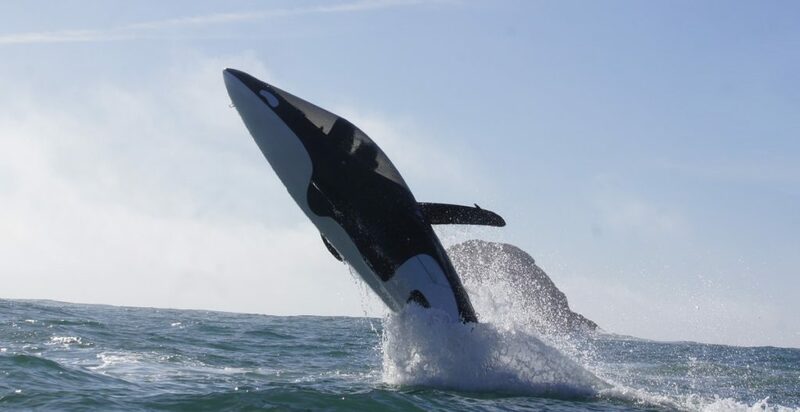 This winsome watercraft lets its rider explore the watery depths as a mighty killer whale. Manoeuvred around London’s Royal Victoria Dock by an expert driver, this half-submersible whale-bot is capable of super speed, tight turns and 90 degree side rolls. This is water sports amped up to 11. Don’t Just Ride the Whale… BE The Whale! Following a wet ‘n’ wild #LiveaLittle: Thames Rockets Powerboating, we’re continuing the water sports theme with this 30 Minute Seabreacher Watercraft Experience. Suffice to say, it’s unlike anything else we offer… and unlike anything else full stop. A sort of futuristic, nature-inspired, madcap trajectory through the foamy waves, Predator Adventure’s new ride is a cause of both exhilaration and terror for its passengers. Stunts include leaps into the air and deep dives below the water. We couldn’t wait to send somebody on this fiendish experience as part of our commitment to the #LiveaLittle ethos. Luckily, Ashleigh agreed to our proposal. When the day of the Seabreacher experience rolled around, Ashleigh felt the pressure. Despite some substantial reservations, she listened to her boyfriend’s encouraging words and set off to Royal Victoria Dock. In the week leading up to the big day, Ashleigh admitting to feeling sorely anxious. Luckily her boyfriend was on hand to take over if she didn’t find the courage when it came to it. In the end, though, Ashleigh went for it. At the dock, she met the owner of Predator Adventures, Adam. He was reassuring and gave her the option of ‘mild or wild’. Choosing the mild option, Ashleigh strapped herself into the passenger seat behind Adam and braced herself for the ride. It began gently at first as they crossed the dock in the belly of the whale. Then the roof came down and Adam cranked up the action, diving deep into the water and building to great leaps into the air. Again and again, the great craft alternated between plunging into the water and soaring skyward. When she returned to the shore, Ashleigh was grinning and feeling hugely proud of herself, having faced down her fear of water and adrenaline rides. Availability: Daily, excluding Christmas and New Year. Age restrictions: Participants must be 16 or over. Under 18s are required to have a waiver signed by a parent on the day. Height and weight restrictions: The maximum permitted weight is 17 stone; maximum permitted height is 6 ft 5. Duration: You can expect to be at the venue for at least one hour, which includes 30 minutes on the water. Numbers on the Day: It’s a one-to-one experience with an experienced driver. Dress Code: You may get splashed getting in or out of the watercraft – please dress accordingly. Other Info: Photos of the experience can be purchased after the ride.